MoonMarble.com - Fritz Lauenstein - "Beach Ball Marble"
Art Glass → Contemporary Handmade Marbles → Fritz Lauenstein - "Beach Ball Marble"
This is a handmade marble by Fritz Lauenstein. 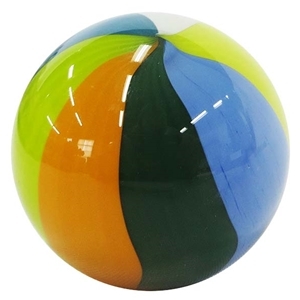 It is an opaque marble with 7 colors in even sections like a beach ball. Marble measures 2" in diameter. Signed and dated.